Did this gentleman, in a droopy-eyed daze of fatigue, stumble up to the vending machine in hopes of refueling himself with caffeine, only to find his wallet empty and the adjacent ATM occupied, at which point frustration and exhaustion overcame him, and he fell to the ground with a final grunt of dissatisfaction? 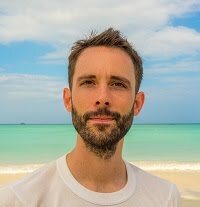 Some sort of grievance certainly must have embittered him, or perhaps he simply slogs through life in a perpetual foul mood, because when roused by the casual chatter of Mother and Son passing by, he barked at them — half in the figurative sense of yelling words, and half in the literal sense of barking like a dog. Contrary to the shivering salaryman in Akihabara who snuggled up next to a cold pile of garbage, this gentleman reaped the benefits of warm vending machine exhaust, as well as the soothing white noise of soft mechanical humming that could lull him to sleep if not for the chatter of passersby. As far as places to nap on the street during winter, one could certainly do worse. Though his soiled winter coat and partially outstretched hands gave him the slight appearance of a beggar, it is extremely unlikely that he was homeless, judging from his relatively recent haircut, his clean dress pants and dress shoes, and most of all his location. 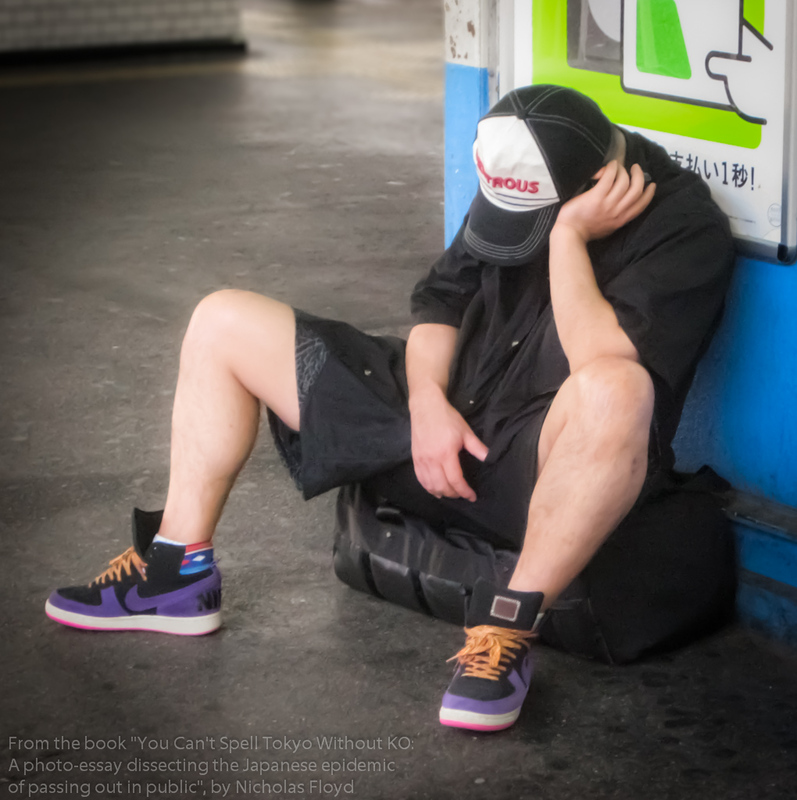 The homeless generally stay out of public view, congregating in makeshift cardboard communities under bridges, in specific corners of large parks, and so forth, and they almost never resort to begging, perhaps because — like most Japanese people — they strive to avoid creating any sort of conflict, nuisance, or inconvenience. Labels: asleep in public, Japan, K.O. 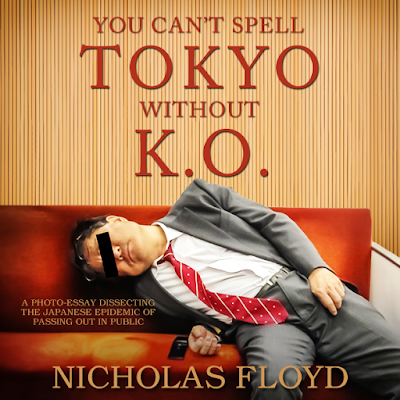 outtake, passed out in public, Tokyo, You Can't Spell Tokyo Without K.O. 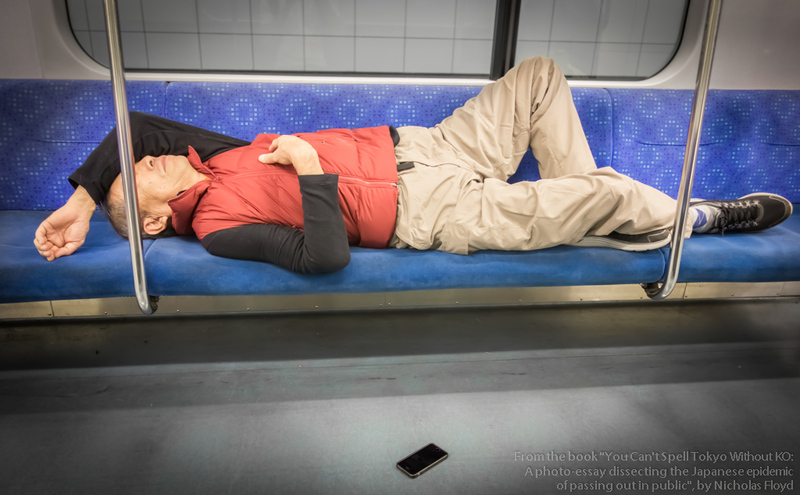 As an example of the blatant indifference with which the Japanese sometimes discard their personal effects, this gentleman's neglected mobile phone could have been snatched up so effortlessly that to some pickpockets it may seem too good to be true. Before passing out, many Japanese people display considerable courtesy toward others by curling into a ball and tucking themselves into a nook somewhere out of the way. Others put forth seemingly little thought or effort toward courtesy and simply spread themselves into the most comfortable position available, flagrant and unapologetic. Even on less crowded late-night trains, shamelessly sprawling out across five seats — especially with one's shoes on — would generally be considered uncouth, but this particular gentleman exhibited a curious inconsistency: despite his lack of etiquette, he extended the courtesy of setting his mobile phone to silent before banishing it from his sight, and it made not a sound other than the soft hum of occasional vibrations as it slid across the floor, one notification at a time. Capturing raw, fleeting moments of nature often requires a certain degree of fortuitous timing: having the camera aimed and ready precisely when that sea lion leaps from the water, flailing for its life, millimeters away from gruesome laceration by a great white's razor-sharp teeth. A flicker of time that lasts perhaps only a millisecond — gone in the blink of an eye — can be immortalized by a photographer with a lot of luck and lot of patience. Snapping this particular photo required no such luck or patience, because throughout the entire twenty-minute train ride this gentleman's tongue only protruded farther and farther from his mouth. As if he had accidentally swallowed bathroom cleaner, he continually puckered his face and clenched his closed eyes into a bitter scowl that bore a striking resemblance to the neon-green icky face of Mr. Yuk poison stickers. Labels: asleep in public, Japan, K.O. 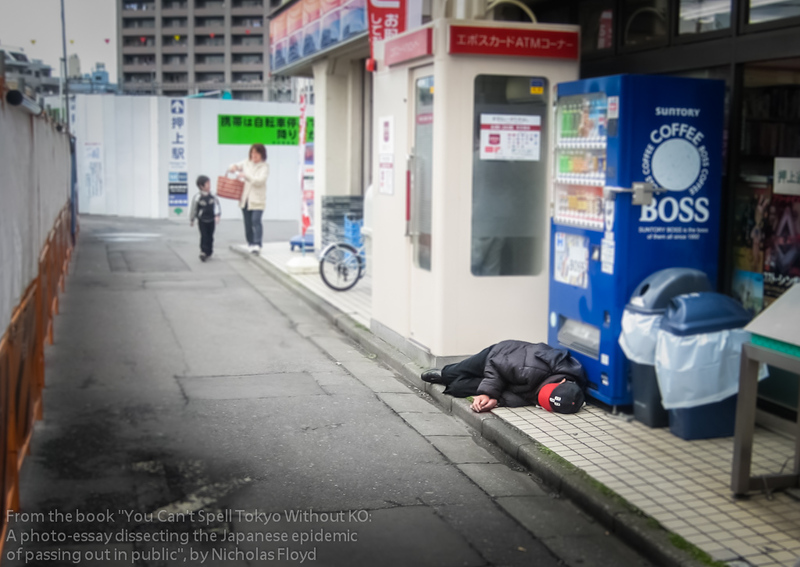 outtake, karoshi, overwork, passed out in public, salaryman, Tokyo, You Can't Spell Tokyo Without K.O.